We are blessed here in Thailand with a climate that allows golfing all the year round. There are very few days where it is not possible to get on to the golf course – and shorts and polo shirts are the order of the day. Only rarely is a light rain jacket or a sleeveless sweater required. But the warm sun on their backs sometimes tempts golfers here to skip their normal warm-up routine they use at home, where perhaps temperatures are a lot lower. Too often I see golfers arrive at the course 10 minutes before their tee time, having barely negotiated the heavy traffic en route. Most golf visitors go directly to the first tee without even thinking about warming up or practicing, and surprise, they double-bogey. How much better is it if you leave your Thai hotel in plenty of time to get to the golf course, do some golf stretches to warm up, hit some nice shots on the range using a variety of clubs, finish with some targeted practice putts, and then arrive on the first tee with a feeling of confidence? Here are two simple golf stretches for playing in Thailand that I always make before teeing off, which helps me warm up and encourages a one piece takeaway swing right from the first shot. 1. Partial Squat with Golf Club: Place your feet shoulder width apart. Place the club in front of you and hold it horizontal with both hands for balance. Lower your body by bending at the knees and raise the club at same time. Stand up straight again and repeat 10 times. Keep your upper body very erect. This exercise increases your blood flow and circulation throughout your body. It is a great total body warm up to help you to make a relaxed, comfortable first swing. The increased range of motion in the hips encourages a more synchronized swing from the ground up. 2. 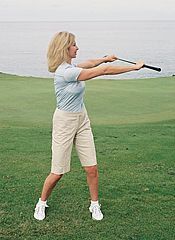 Standing Rotation/Twist with Golf Club: Hold the club chest high, with your grip a shoulder width apart. Whilst keeping your feet and hips fairly stable, rotate the club to the right and then the left. Repeat each side 10 times. This exercise prepares the golf specific muscles in your trunk to make aggressive moves right from the first tee on. On the other hand, I have a 4-handicap friend who plays golf in Hua Hin. His idea of a warm-up is a large bottle of Kloster beer on the golfers’ terrace with a bowl of noodle soup. He then strolls on to the first tee and invariably dissects the fairway with his drive. Let me know how you prefer to warm up for golf by posting a comment here or if you prefer send me an email at my Thailand golf vacation company and I will take care of the posting duties.